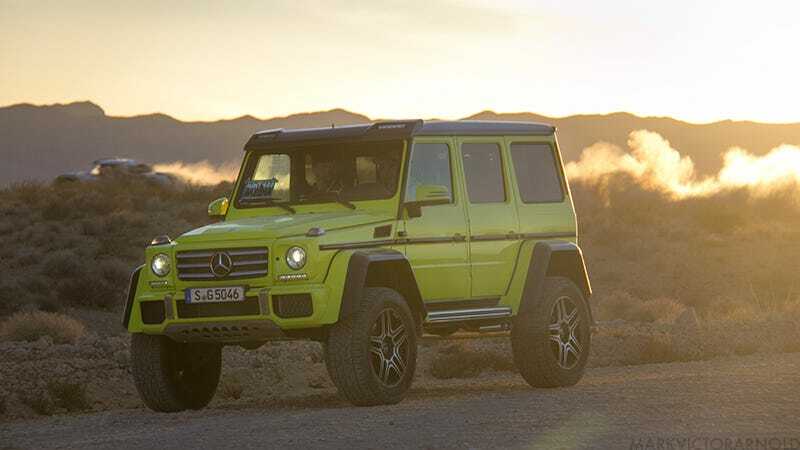 The Mercedes G500 4x4², a rolling caricature of a car built as a monument to what’s possible when engineers develop a sense of humor, will soon be for sale in the United States. Finally, a few wealthy Americans will able to express their extroversion more acutely than they ever thought possible. The G500 4x4² will be known as the G550 4x4² stateside, because reasons. Otherwise we’re getting the same ladder-frame truck nestling a 4.0 biturbo gasoline V8 that dumps 416 horsepower through Merc’s 7G-TRONIC PLUS seven-speed automatic through three locking differentials and onto to all four wheels through portal axles as the rest of the world. Those axles are the G500/G550 4x4²’s primary differentiator. They allow the entire driveline to be lifted, thus increasing ground clearance more significantly than taller shocks would on their own. They’re lifted straight off the AMG G63 6x6, which is not available in the United States but looks just like a regular G-Wagen with six wheels and a pickup truck bed. I’ve been told the truck was originally cooked up exclusively for military applications, and only offered up to the public after Mercedes realized they had more parts laying around than the warfighters needed. But that’s just what a German who claimed to be part of a G-Wagen fan magazine told me. At any rate, we’re now hearing the 4x4² is U.S.-bound straight from Mercedes-Benz after its availability here was a “definitely maybe” when we drove the truck earlier this year. Pricing and exact allocation numbers are being kept secret, but we are supposed to have the truck available through regular Mercedes dealers starting in early 2017. As it stands, the most money you can spend on a stock G-Wagen in America is $217,900, which gets you the 612 horsepower V12 AMG G65. The 4x4² actually only costs $219,000 in other markets it’s set to be available. Though don’t forget you’ll need another $20,000 for the “High-Gloss Electric Beam” (“Hochglanz-Elektrolichtstrahl”) highlighter yellow paint job. Height 76.9" 76.3" 76.3" 88.0"
Wheelbase 112.2" 112.2" 112.2" 112.2"
Ground Clearance (max load) 9.3" 17.2" 10"
Fording depth 23.6" 39.4" 30"
If you’re planning on putting in an order, make sure you spec it with the real military-spec remotely-inflating wheels. You’re going to need more than all-season sport tires to get the most out of this monster drivetrain.